A reader with a keen eye sent me this warning sign, saying it reminded him of the modern workplace. 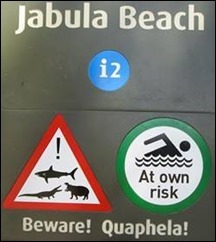 The beach is lovely… except for the sharks, hippos, and crocodiles. It arrived while I was preparing some thoughts on what the workplace has become. The recent Wall Street Journal piece “Everything is Awesome! Why You Can’t Tell Employees They’re Doing a Bad Job” is making the rounds at our hospital. If the pay wall won’t let you read it, I recommend a search using key words from the title – that’s how I got the full text. I have to admit that I was drawn in by the opening paragraph: “Fearing they’ll crush employees’ confidence and erode performance, employers are asking managers to ease up on harsh feedback.” I’m a firm believer in public praise and private criticism. However, the article seems to advocate swinging the pendulum pretty far to avoid any negative feedback for employees. Suggested employee review phrases include “we haven’t done this” rather than “we can’t do this,” which tells me something about the companies advocating this approach: they are probably not in healthcare. What might work at VMware Inc. or the Boston Consulting Group isn’t going to work in a Joint Commission-accredited, CMS-regulated, state-licensed facility where we’re forced to say “we can’t do this” every single day. For those of us on the clinical side, as young nurses or physicians in training, we didn’t get to pick our assignments. We did what we were told and we did it as well as we could possibly do it, with the hope that our next assignment would be more educational or at least less odious. At the end of medical school, physicians almost get raffled off (National Residency Matching Program, anyone?) to hospitals for an additional three to seven years of on-the-job training. The vast majority of us work really hard, in part to make sure we continue to be at the top of our games, but also because we realize that people’s lives are on the line every day when we go to work. In my organization, we’re seeing that as Baby Boomers retire and are replaced by Millennials, we’re being asked more and more to consider employees’ feelings as we assign work to them. I’m not a Baby Boomer, but as someone who has worked in a top-down, mission-critical environment for most of her career, I share a lot of the psychology. For those of us used to doing what needs to be done regardless of how we feel about it, worrying about employees’ feelings is not the first thing one thinks of when something goes terribly wrong. Hospital work places an incredible amount of pressure on everyone to have a zero-error workplace; we need to be able to deliver constructive criticism or even corrective action when it is required. When the Code Blue is over and the patient has either survived or died, we debrief. We talk about the team, how things went, and sometimes the emotional side of it. But that’s well after the fact. When an employee has a lot of issues or requires more remediation than makes sense for their skills and role, the ability to provide clear feedback is essential. Feedback needs to be ongoing — no one should ever be surprised by what they hear in a performance review. Additionally, we’ve seen employees (and former employees) become more litigious over the last few years. Having appropriate documentation of non-performance and resulting interventions is essential to managing those situations. It’s more difficult for someone to come back at you for wrongful termination when you have a well-organized history of events. The article cites experts who agree that “tough feedback sometimes motivates people better than praise,” but it was well below the fold. Tough feedback certainly doesn’t mean yelling at staff or belittling them, but it may mean making clear statements of events and their consequences that workers are not ready to hear. Reading through the 130+ comments on the piece, I’m not the only one with second thoughts about some of the approaches recommended. One had a great point about the concept of work teams: “Playing on a team is based on performance, perform well = get to play, if I don’t, I remain on bench or I am removed. Regular coaching includes what an employee does well and recommendations on what will allow them to reach the next level of performance.” Another asked, “If we equate a company department or division to an orchestra, how long would the conductor let bad musicians ruin the entire performance? I’ve seen that situation first hand, when more than half of a manager’s subordinates applied for transfers over a 12-month period. The underlying issue was his inability to deal with two members of the team who were not performing. They were perceived as favorites and the others were afraid to speak out, so they left. I’ve also seen the dark side of ignoring poor performance, when the team members who were tired of picking up the slack went on the offensive. They ultimately took down not only the underperformers, but also the manager. Every workplace is different. Although some management strategies involve clear expectations and performance goals, others can be quite murky. There may be hidden (or blatantly advertised) agendas and infighting. In other words, the beach may be lovely… but watch out for the wildlife. How does your organization find the right balance between praise and correction? What did you think about the WSJ article? Email me. And how exactly is this tied back to millennials? You lost me halfway.